Ten sessions remind you how highly God values truth and equip you to live with integrity. Doing as Jesus would do has been a centuries-long goal of Christians who pursue integrity. When have you seen someone really imitate Jesus? What has happened when you have tried it? A life of integrity includes commitments—both chosen and dictated by circumstance. How do you experience God's commitment to you? What commitments do you have and how do you keep them? Are you a sprinter, a marathoner, an observer? What kind of endurance do you have in your relationships with God and with other people? How can improving your endurance help you live with greater integrity? What situations make hedging the truth most tempting to you? What does this reveal about your motivations or values? And how can you better align your motivations, values—and words—with God? What has happened in your life and relationships when you failed to exercise self-control? Here is help for identifying weaknesses and fortifying your governance of strong emotions, deep desires and unconscious habits. People appear in many shapes and sizes—all given bodies by God. How do you misuse or neglect your body? What should you do to care for your body? Why is your body important to living with integrity? Temptation is unavoidable. Though God promises not to let you be tempted beyond what you can bear, you still must prepare yourself to deter or defeat the temptations that are part of daily life. What tempts you most? What can you do to deal with temptation? Take inventory of how well you use the power of speech to encourage, appreciate and comfort. And consider how easily you might withhold words of forgiveness or instruction. Ask God to help you use your tongue with integrity. The story of Peter and Jesus offers a powerful example of forgiveness. Why is forgiveness so difficult to give? And to receive? How have you experienced or offered forgiveness? What are the events in your life that have built up your trust in God? Today, when you are in a crisis, what kind of prayer are you likely to pray? How can your life experiences of God help you to pray with trust and confidence? Carolyn Nystrom is a freelance writer and editor based in the western Chicago suburbs. She is the author of the LifeGuide® Bible Studies 1 & 2 Peter and Jude, Old Testament Kings, New Testament Characters, Integrity, and Friendship. Doing as Jesus would do has been a centuries-long goal of Christians who pursue integrity. When have you seen someone really imitate Jesus? What has happened when you have tried it? 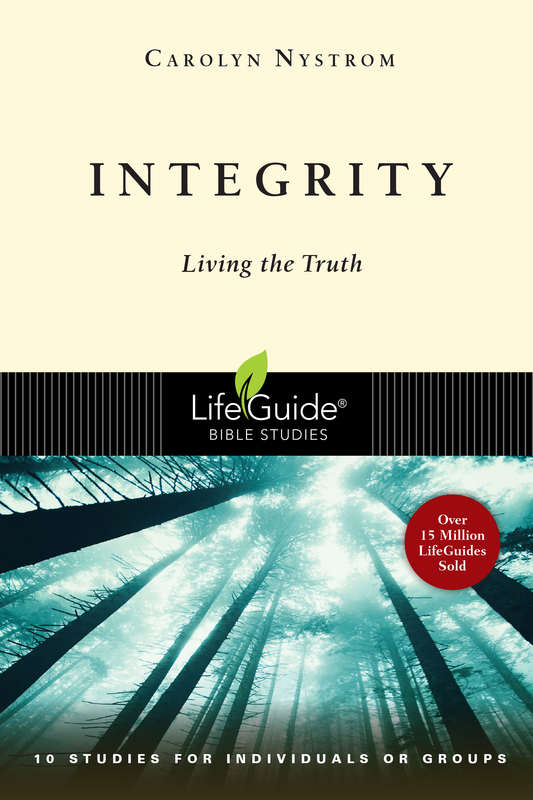 In this Bible study, 10 sessions remind you of how highly God values truth and equip you to live with integrity.